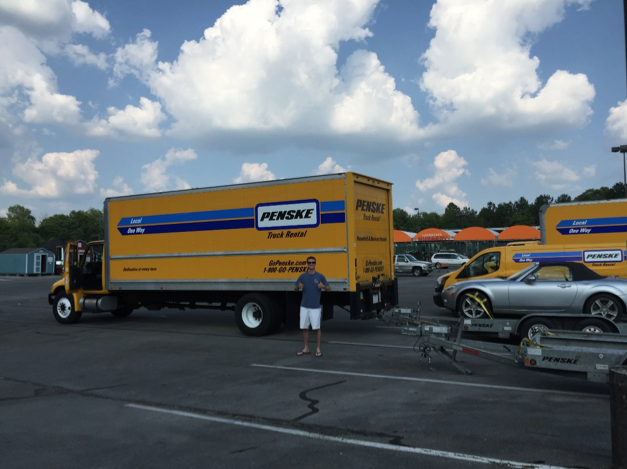 Dr. Joe Vaughn starts his cross-country drive June 8 from Birmingham, Ala. to Los Angeles to San Francisco to Seattle. I drink two cups of coffee a day. Minimum. Sometimes, I don’t even want to drink that second cup. I do it because I feel like I have to. Like people will look at me in a strange way if they found out. I can hear it now. “You only drink ONE cup a day? !” they would gasp. (From left to right) Drs. 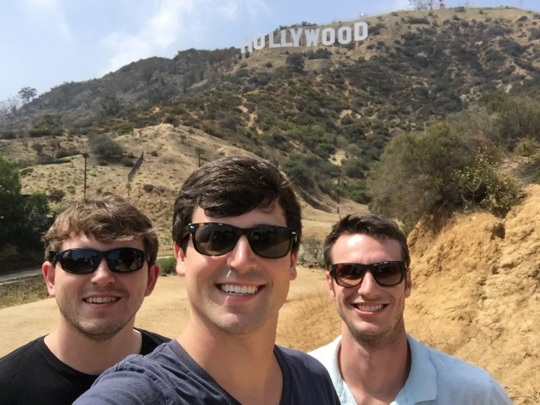 Joe Vaughn, AJ Fennell and Ben Samuelson sightseeing in Los Angeles on a June 11 trip. I’m a Seattleite. A new one. A very new one. My waiters still do double-takes whenever they see those beautiful red “ALABAMA” letters plastered across the top of my driver’s license. I graduated from the University of Alabama at Birmingham School of Dentistry just two months ago. It wasn’t seven days later before I had my entire life packed up in a moving truck heading across the country for Seattle, Washington. It was just me and two of my classmates. Traveling the country. Driving all through the night. Experiencing America as we never had before and may never again. The trip of a lifetime. I grew up in Alabama. I ate middle school lunch pizza in Alabama. I studied college physics in Alabama. I spent my childhood looking into the eyes of Paul “Bear” Bryant and Joe Namath in the paintings above my parents’ fireplace. As a teenager, I sat in the stands amongst 100,000+ people in Tuscaloosa all yelling “Roll Tide” at the top of their lungs every time our team did something even remotely exciting. So what am I doing here? Why am I sitting in this minimalist coffee shop in the Emerald City? Why do I eat Thai food now and drink lattes and ride the bus twice a day? Good question. Let’s talk about it. I think there’s value in “newness.” Something new, something different. I have friends that will buy the newest version of the iPhone no matter how long it’s been since the last one came out. The iPhone is their fix of newness. That works for them, and that’s awesome. In a weird way, they are an inspiration to me. For us dentists, finding that change, or that newness, is just as important. We all hear about those stories of the older guys who have fallen out of love with dentistry. The ones who have lost touch with their younger selves and just can’t wait to get out of the office. We may have even had a classmate or two drop out of school because they couldn’t handle the routine. 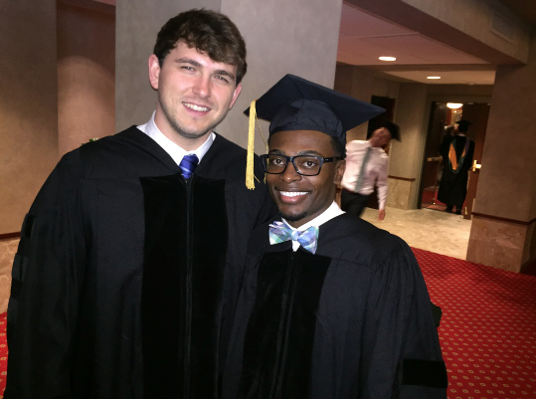 Dr. Vaughn and Dr. Devon Cooper on graduation day in Birmingham. Newness gives us and our profession a tune-up. Seattle is a big change for me. But one day, I’ll have to find another source of newness. Because newness is not geographical. You don’t necessarily need a new city. Your newness will probably be different than mine. It could be a specialty. A procedure you’ve never tried before. A new technique to an old procedure. Working one day each week in a community health clinic. Joining a social club. Reading a book. Challenging yourself with ideas you’ve never considered before. You could keep a journal or write a blog. Play an instrument. Bake something. Whatever it may be, the point is to keep you, your life and your job fresh and fun and totally worth all that hard work you put in to get it. And a healthy happy you makes for a healthy happy profession. Which means me and you and everyone we know benefit from the newness you and I decide to add to our lives. 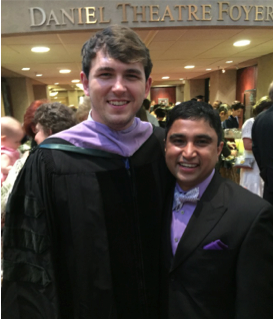 Dr. Vaughn with one of his clinical faculty members, Dr. Rama Kiran Chavali. Dentistry promises great things. It is so overflowing with potential that even its opportunities have opportunities. But we always run the risk of falling into the pattern of dread and routine. And before you realize it, all of your techniques and equipment and philosophies are 15 years behind the times. Don’t be that dentist. Instead, join me in adding newness to your life, whether it’s work or personal. And in turn, keep our profession crisp. Fresh. New. We are a part of one of the greatest professions in America, and we have our entire careers ahead of us. I don’t know about you, but I can certainly “Roll Tide” to that.